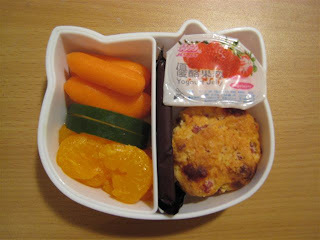 She has a ham & cheese muffin (thankfully, I made a dozen last go round), a few carrots & a slice of cucumber, mandarin oranges (I'm out of any kind of *real* fruit), a strawberry yogurt jelly & a mini Hershey's bar. She brought it all home. Apparently, I forgot today was pizza day at school.